What do powerful works of art, great leaders, and successful advertising have in common? They inspire us by evoking the power of emotion. Feeling is the lifeblood of communication. Without feeling, communication is abstract, dry, and uninspired. Emotional tone is what elevates the mundane to the meaningful. In spite of this, we often choose to minimize feeling. We leave it out of our workplace norms, erase it from our email communications, and when it shows up in a meeting, do our best to bring things back to territory that feels more matter-of-fact. Yet we exclude feeling at a price. Over time, we stop feeling engaged in what we’re doing. Our interactions feel flat, robotic. We feel like we’re forced to check part of ourselves at the door. Worse, we start to doubt how much we can share with those around us and our sense of well-being erodes. Being able to include emotion in a way that inspires and connects is a skill, and it rests on a foundation of emotional maturity. When we can be comfortable entering the territory of our own feeling states, we won’t feel compelled to run the other direction when they show up in others. When we are emotionally mature, we can meet emotions with compassion, allow them to inform us, and act in more wise and skilfull ways. Like a painter choosing from a palette of colors, we can include emotional expression to bring more beauty, depth and meaning into what we’re doing. Become More Courageous and Wholehearted. Expand your Emotional Range. Being an emotionally mature adult is an artful act of balance, self understanding, and courage. It isn’t about feeling so much that we can’t get out of bed. And it certainly isn’t about minimizing feeling and relegating it to the margins. With emotional maturity, we are able to feel deeply, and let go. We are able to be moved in one moment, and pragmatic in the next. We are fluent, adaptive, and free. The impact on the world around us is that others are invited to be more free, and more wholehearted. Our emotional maturity encourages other people to be more fully themselves, to experiment, and to take risks. It communicates that we are someone who can be trusted, relied up on, and turned to for guidance. Most of all, our emotional maturity signals that in a chaotic and changing world, it is possible to be fully alive without going to pieces or numbing out. In this on-demand self-paced training, you will gain a more complete understanding of your own emotions. You will learn how to encounter any emotion with willingness and wisdom, and how to utilize the intelligence within any emotion. Overcome the tendency to cling to emotional experiences. Learn how to identify the wisdom in any emotion. Go beyond the tendency to suppress or deny feelings. Become comfortable entering challenging emotional terrain. Develop emotional fluency with six primary emotions: Fear, Anger, Grief, Confusion, Longing, Jealousy. Learn the 7-step practice for metabolizing an emotion. Learn how to unpack complex emotions and work with contradictory feelings. Increase your emotional fluency and range of motion. Develop the courage and confidence to include emotion in service of creativity. Experience the best of Diane’s teaching, carefully curated for you to follow at a pace that works for you. You’ll have access to all video lessons, audio tracks, plus written summaries and practices through our new streamlined course website. You can read, review, and reflect at your own pace using session notes to deepen and clarify your understanding. Go beyond conceptual understanding and put your new skills into practice with the support of these well designed and easy-to-do practices. Access the course via a private, easy-to-use website that features all your learning materials organized in one central place. This course is approved as a recertification provider for members of ICF, SHRM and HRCI. By completing all modules, you can receive 10 recertification credits. Allow us to introduce Diane Musho Hamilton—a teacher and mentor to many of the most exceptionally talented people we know. Diane is the co-founder and lead trainer of Integral Facilitator programs, which are the heart of our in-person trainings at Ten Directions. Diane is exceptionally gifted in the realm of group dynamics and interpersonal subtlety, and as a teacher, she brings warmth, humor, spontaneity and wisdom to everyone she teaches. Thousands of people around the world have benefitted from the extraordinary depth and skill of Diane Musho Hamilton’s teachings. Diane is an exceptionally gifted mediator, master facilitator, author, trainer, and consultant. As a mediator, she is well known as an innovator in dialogues, especially conversations about culture, religion, race and gender relations. She is the recipient of several prestigious awards for her work in this area, including the Peter W. Billings Award from the Utah State Bar, the Utah Council on Conflict Resolution Peacekeeper Award, the Judicial Administration Award and Friend of the Court. Diane is also the 2016 recipient of the Brigham Young University Peacekeeper of the Year Award. She is the Co-Founder of the acclaimed Integral Facilitator Training Program. 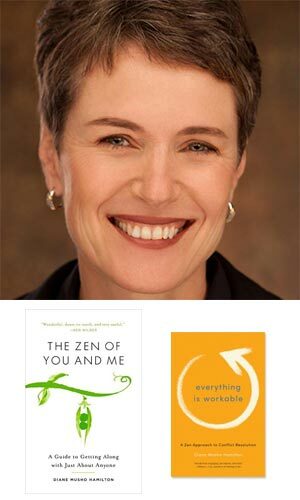 Diane is the author of two books, Everything is Workable: A Zen Approach to Conflict Resolution and The Zen of You and Me and is a contributor to Harvard Business Review. I loved the course! In my work as change advisor, I design, guide and support positive change at micro, organizational and macro levels. For years now I’ve noticed that the amount and speed of change requires new practices and new skills. In a nutshell these are definitely the 21st century skills that In This Together offers for change leaders and collaborators to be successful together. Energizing, dynamic and foundational are some of the words that begin to describe Diane Hamilton’s, ‘In This Together—Communication Wisdom for the World of Work’ offering. I feel that this course is a must have for anyone who is looking at going Teal or working with next stage organizations, or simply wants to have a better relationship with others. I was absolutely blown away by how much I took away from it!! As a Leadership Coach, I’m often working with clients who simply struggle to communicate well with others in the workplace, whether that be their boss, their peers or their direct reports. I took this class in hopes of finding some strategies/tools that I could pass on to my clients (which I absolutely did), but more importantly, I realized that the real learning was about my own way of communicating and I took something away from each and every session. I cannot say enough about this experience and have already recommended it as a course to both my clients as well as my fellow coaches. Thanks to everyone at Ten Directions for this incredible experience! I look forward to engaging in more programs with you all! This course has already had a positive impact on my life and work. I am more aware of my listening, intention in communication and open for feedback. With that, I am also a better coach for my clients. I honestly thought the course was fantastic. I looked forward to it each week. The team worked so well together to create a rich, interactive online experience for such a large group. Overcome the tendency to feel too much, or not feel enough. Overcome limitations in your willingness to feel. Learn to differentiate from feeling without denying it. Learn to include feeling in your communications and collaborations. Make use of the wisdom available in any emotion. Identify the intelligence within even the most challenging emotions. Learn to utilize the energy and insight of emotion as a source of creativity. Overcome the tendency to avoid or fixate on these emotions. Develop your willingness to feel these emotions. Learn how they affect thought and behavior. Learn how to metabolize these challenging emotions. Learn to loosen the grip of fear in the body. Learn to include and express these emotions in healthy ways. Appreciate the role and value of anger. Understand how to work with anger in others. Develop your ability to process anger. Expand your options for expressing anger. Cultivate courageous willingness to enter this emotional territory. Learn how to stay present with these overwhelming emotions. Become more willing to feel and learn from sadness. Let go of coping behaviors and avoidance. Learn to trust this emotion and identify the intelligence within it. Recognize the subtle signs in yourself and others. Understand how this feeling arises in relation to other emotions. Become more willing to experience this emotion and learn from it. Learn to find the insight underneath this emotion. Experience these emotions without habitually clinging to or rejecting them. Recognize the “sticky” quality of these emotions. Learn to experience them without being captured by them. Increase your ability to release and let go. Learn to unpack complex emotions and work with contradictory feelings. Increase your discernment and awareness of complex emotions. Unpack complex feelings and identify their multiple qualities. Discover greater ease and tolerance with conflicting feeling states. This course is approved by two prominent professional HR Certification organizations as a recertification credit provider. Both SHRM and HRCI are organizations that reflect the highest industry standards for HR professionals. If you are an HR professional who is certified by either SHRM or HRCI, you need to maintain your certification and demonstrate that you remain current in the field by acquiring recertification credits. By completing all modules in this online training, you can receive up to 10 recertification credits from either (or both) of these organizations. And if you’re not a certified HR professional, you can take the course just as you would any other professional training. Diane is a knowledgeable and dynamic instructor! The course introduced me to a variety of important concepts like compassionate listening and effective conflict resolution. The information and skills I learned in this course will be very useful in my work as a facilitator, in my family life, and my ability to be even more resilient – and I look forward to integrating them into my practice. Thank you! It is rare to encounter a course that can clarify the subject matter by both taking the Big Picture perspective to look at processes and patterns and take the personal, intimate view of what is happening in my own mind/heart/body. The Freedom to Fight course does both and does them well and integrates in way that creates confidence in the creative potential of every fight. I highly recommend this course to anybody who has the curiosity and courage to be a fuller participant with whatever challenges Reality is presenting. Another excellent Ten Directions course! There is little more relevant these days than how to engage others productively in the face of conflict. I am a big fan of Diane Musho Hamilton and to learn from her mastery is an absolute pleasure. The result for me was greater ability to respond to and influence shifts in interpersonal power — all towards the end of reducing conflict and building a basis for shared understanding. Freedom to Fight was one of the most personally and professionally rewarding programs I have ever taken. The warmth and presence of Diane and all the facilitators made it feel so personal in ways I’ve not experienced before in on-line work. Content was broad as well as deep.Delivery was well paced with opportunities to learn from each other as well. This was a great opportunity to gain some valuable personal and professional insights and practice new skills. I highly recommend this program. What I love about the courses with Diane are these seemingly simple teachings – the classic one-liners – that wake me up, those are often the keys to powerful breakthroughs in both my personal and my professional life. That they stem from a source of real experience and self-enquiry is what gives Diane’s teachings such impact. The skill of Emotional Maturity brings more well-being, freedom and insight into our lives, and the lives of those around us. We are more free to feel, and paradoxically, more free to let go of our feelings.